The uncertainty generated by the energy politics of the government of Evo Morales has a negative impact on investment, states the author. The current production of hydrocarbons is stagnant and unable to cover, in the case of natural gas, the exportation commitments with Argentina, Brazil, and Chile. In addition, in case of the liquids, the increasing requirements of Bolivia’s own internal market cannot be covered by hydrocarbons. It remains slightly contradictory because in 2002 Bolivia aspired to be the energetic core of the whole region. (From La Paz) LATIN AMERICA, WITH A SUSTAINED GROWTH in the last four years nearing 5 percent of its Gross Domestic Product (GDP), seems to be passing through a period of continuous economic thrust. This change comes accompanied by a geopolitical turn in which the energy factor becomes key, the most evident manifestation of this tendency being the peak achieved in the producing countries by the discourse of energy nationalism, expressed as two different visions. On one side, Venezuela, which understands it from an anti-imperialistic position, trying to use it to aid in breaking the single-pole hegemony and fragmenting the process of globalization. On the other hand there is Brazil, which conceives this nationalism from a less fanatical position. Brazil follows a path more open, pragmatic, and in agreement with a more intelligent globalization. “In Bolivia, the energy factor has shown extreme ambivalence; it is the generator of a promising future but also appears as a carrier of new fears” In the Venezuelan line, we find Bolivia, a country in which atavistic sentiments that pertain to a determined territory have been exacerbated. In the external, we find that Bolivia harshly criticizes businesses and transnational foreign capital. In the internal, there is extreme regionalism from departments that have major reserves of gas and oil and that fight autonomy on the revenues that these resources generate. In Bolivia, the nation and the region are exalted. In addition, the warm values that Noberto Bobbio refers to are appreciated. Warm values are related to the ideas of mother land, nationality, or region, with the attachment to land, a cultural and linguistic tradition, to an ethnic group, or to a religious confession. On the contrary, the cold values would be related to the defense of the civility, the laws, political, and juridical institutions. According to Bobbio, warm values are emotion and passion. On the other hand, cold values are personified in the State and the laws that demonstrate ration and reflection. “Bolivia has erased the contracts signed with Argentina that promise a gradual increase in gas volumes” In the case of Bolivia, the energy factor has shown extreme ambivalence; it is already a promising future generator but also appears to carry new fears: integration and conflict, security and insecurity, of the capability and incapability of governing. The unequal endowment of energy begins to reproduce the curse of natural resources, characterized by the perverse effects of wealth in countries with fragile institutions. The uncertainty occasioned by the politics pushed by Evo’s government has begun to generate a negative impact on the levels of investment. “The lack of investment in Bolivia contributes to a greater transference of energy in the region where the potential members do not perceive necessary guarantees for future supplies” It is already unquestionable that the current production of hydrocarbons is stagnant and is insufficient to cover, in the case of natural gas, the compromises of recently assumed exports and, in the case of liquids, the growing requests of the internal markets. Bolivia has had to erase the contracts signed with Argentina, those that promised a gradual increase in the volume of gas sent to this country. This shortage of supply has caused struggles between Brazil and Argentina. Petrobrás assured that the company will deliver not even one molecule of Bolivian gas, to relieve the fuel shortage in Argentina. 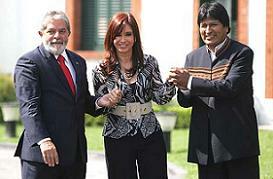 The Bolivian President, Evo Morales, met with the Argentinean President, Cristina Fernandez, and the Brazilian Lula da Silva to discuss the topic; however, they did not come to a successful conclusion. The lack of investment in Bolivia contributes to a major shortage of energy supplies in the region, where the potential associates do not perceive the necessary guarantees of future supply, which forces them to look for other more complicated options. “Chile feels confident in being able to buy Bolivian gas, and has realized an energy agreement with Ecuador and has launched massive campaigns to promote energy savings for its citizens” Argentina stands out as the country with the highest risk of suffering from bottle necks or energy limitations. Argentina has seen the obligation of importing liquefied gas by maritime routes. The petrol company Repsol YPF will transport to Argentina a shipment of liquefied natural gas (LNG) to inject approximately eight million cubic meters daily into the local network. This volume overcomes the duplication of the one that Bolivia sends today (less than 3 millions), but the same thing will happen with the price: between 12 and 14 dollars for MBTU, which will be subsidized. Nevertheless, it is far from the 27 million cubic meters that Bolivia admitted not being able to export to Argentina in the next three years. With regards to Brazil, Petrobrás signed an agreement with the Anglo-Dutch company Shell to purchase a firm supply of LNG. “Bolivia asks that they buy less and the increasing market has lost on the Pacific coast” The agreement attends to part of the import capacity of the petroleum company, which already has signed similar agreements to cover the needs of imported gas destined to thermal plants. The LNG is transported in large ultramarine tankers and the fuel must be decompressed in the loading terminals to inject it into the national gas pipeline system. Chile still feels confident in being able to buy Bolivian gas, and at the moment has come to energy agreement with Ecuador and has launched massive campaigns to promote energy savings among the citizenship. And Bolivia, in spite of being the leader of the continent in certified commercial gas reserves, is importing liquefied gas from oil to supply the internal market. This is contradictory in a country that, until the year 2002, was expecting to change into energy nucleus for the entire region. Currently, the situation is different: the country asks its neighbors to buy less and has lost the growing market of the Pacific coast (in the border zone between the United States and Mexico) to which the project, Peru LNG aims primarily today.